On February 27, Congresswoman Pramila Jayapal (D-WA) introduced H.R. 1384, the Medicare for All Act. Japayal introduced the bill with over 100 original co-sponsors and the “unprecedented support” of many major unions, who have finally joined UE’s longstanding support of a Medicare for All single-payer healthcare system. At the press conference announcing the bill, Jayapal made the point that Medicare for All is an issue that crosses partisan lines. 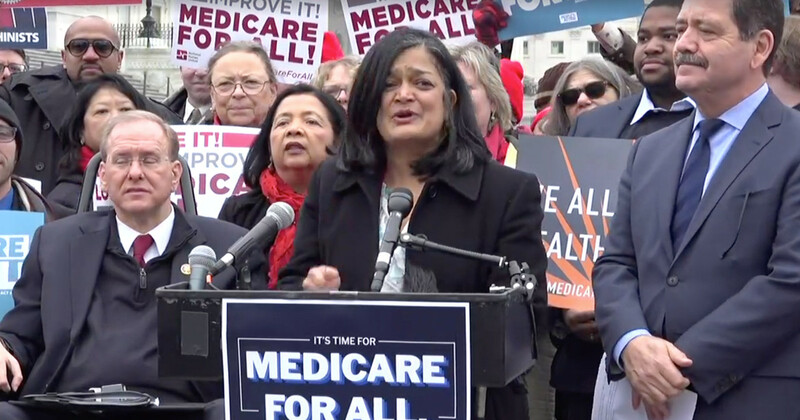 “Everywhere, people understand that it is inconceivable that as the richest country in the world, that we would be the only major country that does not guarantee healthcare to every person,” said Jayapal. Jayapal’s bill will provide a comprehensive package of benefits, including primary care, hospital and outpatient services, prescription drugs, dental, vision, audiology, women’s reproductive health services, maternity and newborn care, long-term care services and supports, mental health and substance abuse treatment, laboratory and diagnostic services, ambulatory services and more. Patients will have the complete freedom to choose doctors, hospitals and other providers, and the bill preserves the ability of veterans to receive their medical benefits and services through the Veterans Administration if they wish, and of Native Americans to receive their medical benefits and services through the Indian Health Service, if they wish. The full text of the bill is available on Rep. Jayapal’s website. The press conference was also addressed by Congressman Chuy Garcia (D-IL), a long-time UE ally in Chicago who was elected to Congress last fall. A full video of the press conference is available on the Healthcare-NOW Facebook page. On March 16, 18 members of UE Locals 735 and 770 gathered at the Local 735 union hall in Butler, Indiana for a Sub-Region Education Conference, where Western Region President Carl Rosen led a new UE workshop on Medicare for All. According to Rosen, the workshop “led to some healthy discussion,” and most of the participants committed to call their congressperson to ask them to support H.R. 1384. Many members also took copies of the workshop materials (a flyer, fact sheet and healthcare cost calculator) to use in their shops to educate their co-workers. Local 770 President Drake Randall said, "I am for Medicare for All because it is obviously the best plan for me and my family." Jennifer Grobis of Local 735 said, "I support Medicare for All because I'm tired of paying over half of my paycheck for my health care."